Police say a drunk man driving a construction crane left a nine-mile trail of destruction on the Long Island Expressway, hitting four cars and totally obliterating one of them before a cop jumped into the cab and got him to stop. Greg Cergol reports. Police say a drunk man driving a construction crane left a nine-mile trail of destruction on the Long Island Expressway, hitting four cars and totally obliterating one of them before a cop jumped into the cab and got him to stop. Brian Sinclair, 47, of Riverhead, was arrested by exit 63 on the LIE after a highway patrol officer spotted him driving erratically and gave chase, according to Suffolk County police. Cops had the vehicle surrounded and say Sinclair still didn't stop; when he finally slowed down, an officer leaped into the passenger compartment and demanded he stop, which he did near exit 63, police said. 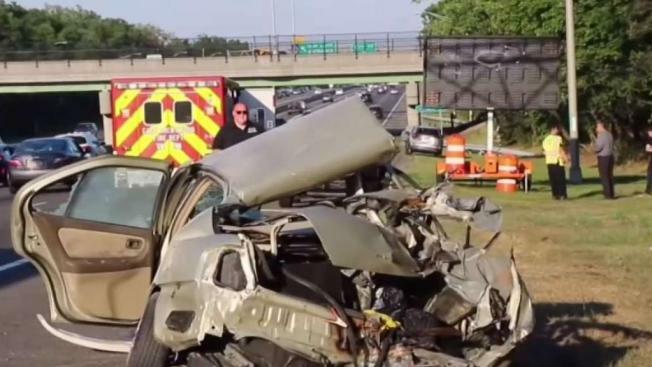 Officials say Sinclair was driving a 2000 Liebherr crane on the LIE in Ronkonkoma on Tuesday evening when he hit a Nissan Altima, then smacked into a Jeep Cherokee. He then barreled into a Honda Civic and hit a Toyota RAV4, then drove off, authorities say. It was a short time later when highway patrol officer Joseph Goss spotted the crane. "I really started to get into panic mode because I thought he was going to crash and kill somebody," Goss said Wednesday. "Realistically, that thing was a tank going down the road," he said. Another pursuing officer forced the truck to the shoulder of the road, and as it slowed down, Goss left his patrol car, jumped on board the truck and pointed his weapon at the driver. "The only thing he said to me was, 'What's up,'" Goss said of the crane driver. "He never said another thing to me." Three drivers in the cars that were hit along with the officer who got the crane to stop suffered minor injuries and were taken to an area hospital to be treated, authorities said. Sinclair, who refused to take a blood alcohol test, was charged with driving while intoxicated and leaving the scene of an accident, Suffolk County cops said. The crane was impounded. His attorney said he was entering a plea of not guilty and is "maintaining his innocence." Attorney information for Sinclair wasn’t immediately clear. He will be arraigned in a Long Island courtroom on Wednesday. Goss was praised by his colleagues Wednesday, but he brushed it off: "I didn't think at the time it was difficult. I was just doing my hob, to be honest."